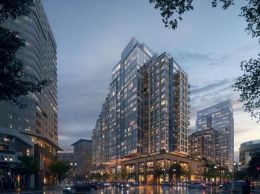 The Seaport area of Downtown Boston is one of the fastest growing, newest and most luxurious neighborhoods in the entire city. New buildings are popping up almost monthly and the skyline change is measured by the day, not year. Trendy restaurants are clamoring and opening up in the retail spaces located under the new glass towers. The Seaport is a blend of high end real estate, both condominiums and rental apartments as well as class A office buildings that sit right on the water and are filled with Fortune 500 company headquarters like Fidelity Investments, PWC, Wellington Management and Vertex Pharmaceuticals..
Echelon Boston Seaport - An exciting ultra luxury condos building in its pre-construction pricing stage. Pier 4 Condos - Currently under construction. Ultra luxury condo building directly on the water with city and harbor views. 22 Liberty - Built in 2015 this ultra luxury condo building sits directly on the water. 50 Liberty - New construction, ultra luxury condos directly on the water.